I don’t know if you are like me but the amount of paperwork my kid brings home from school is overwhelming. If I’m not careful, I could be buried alive in all the papers. One of my goals for summer real was to get all the paperwork that was clogging up my hall closet organized and to get a routine that is manageable. I came across a system that I thought would work for me. I love the website A Bowl Full of Lemons and when I read this post I knew I had a winner. I had my husband get down the tubs of of saved papers out of the top of the closet so that I could get started. 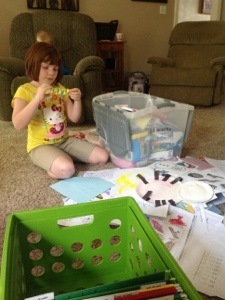 That’s right I had 2+ tubs of papers, drawings and cards and Paige is just going in 2nd grade. At the rate we were going, we would have to build on to the house to keep all the stuff that comes home from school and church. I’m not going to lie, it was a grueling 3 hours and my living room still looks kind of like a tornado hit but the papers are all organized or trashed. I wanted containers that closed like in this post but our Walmart did not have a great selection and I’m not headed to a real town for awhile. I might change it out sometime but for now I’m happy. 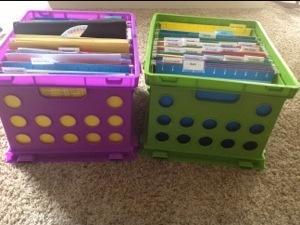 I made files for each year of school and anything else that my kids accumulate. I’m sure there will be some adjustments and additions but it’s a start and I think it will make life a lot happier when school starts again in a few weeks. So go over to A Bowl Full of Lemons and have fun getting organized! Wow, it’s been awhile. I’m not sure why I haven’t blogged. I’ve just been living my summer hermit lifestyle of barely leaving my house. The other day I took both kids to Walmart. Most of the time I try to just take one. You might find it surprising that most of the time, Parker is the one I take. He refers to himself as my shopping buddy but really I think he has realized if he does the shopping, he gets to make decisions like which type of chips or flavor of yogurt we buy…he’s a crafty fellow. Anyway, we needed several things, it was the middle of the day, it couldn’t be helped. We were standing in the garden section when Parker took off. He has never ventured away from me before. I was shocked. We found him in the toy section, surprise, surprise. I swiftly put Parker in the cart and told him why that was a bad idea. He started screaming, “Stop it Mom, you are hurting me!” Let’s be honest, I wanted nothing more than to spank Parker right there in the middle of Walmart but in this day we live in, you never know what happen if you discipline your child. I promise I wasn’t touching him. So finally Parker settles down and we continue our shopping adventure. After we had checked out, we stopped in Subway to get some lunch for Blake who was short handed at work that day. The line was really long. We waited, played my phone, talked and just minded our own business while we waited. As we walked around the corner to get our drinks, a Walmart employee who was enjoying her lunch, pulled me over and told me how impressed she was with how well my kids behaved. All I could do was laugh. I thanked her and told her she obviously hadn’t seen the scene was had made in Walmart. I love my kids. They are good kids. Sometimes I want to ship them to boarding school. It’s funny how such opposite things can happen so soon. It’s always an adventure with us.